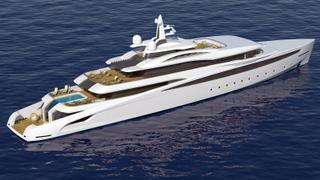 Monaco-based design studio The A Group has released details of its latest concept, the 85 metre Project Affinity, which is an evolution of its 2015 concept A470. Developed in collaboration with SuperYachtsMonaco, this sleek tri-deck design was revisited after a series of successful residential design projects. The resultant design, named Project Affinity, balances curvaceous elements with a single unbroken sheerline running all the way from the beach club to the bow. Vital statistics include a 14 metre beam and a total internal volume of 2,250GT. In a statement, the studio explains: "The design is targeted towards owners who are looking for efficiency — both in build and in operation. [Our] in-depth knowledge of the latest Red Ensign Group Yacht Code rules development means that all drawings provided are already at a mature stage." 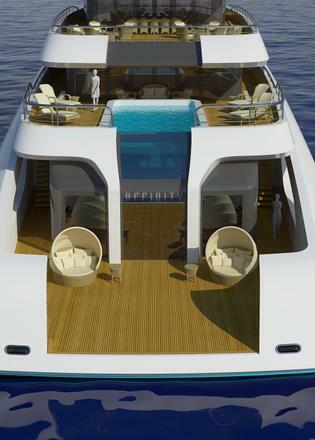 Guests arriving on board via the aft swim platform will be immediately struck by the sheer volume of glass on board. Full-height sliding glass doors lead into the gym and spa area, which measures 100 metres square and includes a sauna, hammam, massage room and hairdressing salon. 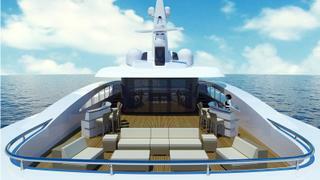 Moving upstairs and the main deck aft is dominated by a six metre long swimming pool and adjoining ten-person Jacuzzi. Dedicated sunworshippers can soak up the rays on the four sunloungers that flank this area. Other key features include an on-board cinema, a superyacht elevator serving all decks, and an indoor/outdoor dining area that can be easily opened up to the elements. In reference to the interior décor, the studio adds: "We are developing certain spaces of the vessel in a modern, clean style based on our recent success in residential and architectural design." MCA and Lloyd’s compliant, Project Affinity would offer accommodation for up to 12 guests split across six staterooms, including a master suite that measures 100 square metres and five double guest suites that measure 25 square metres each. 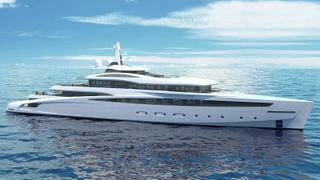 Meanwhile, the crew quarters on Project Affinity would be suitable for a staff of up to 32 people. 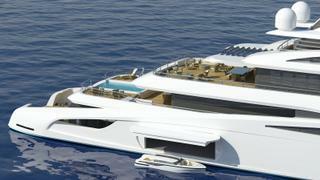 The A Group has also given great consideration to tender storage, with room for a 9.6 metre limo a 7.1 metre watersports boat and a pair of six metre crew tenders, with enough room left over for Jet Skis and various other water toys. No build partner has been chosen as yet, but power would come from a twin-screw propulsion system for a top speed of 20 knots and comfortable cruising at 18 knots. When trimmed back to her economical speed of 14 knots, Project Affinity would boast a globetrotting range of 6,000 nautical miles thanks to a slender and efficient hull shape, which is equally well suited to diesel or hybrid propulsion.